This is the world in a universe that diverged from our own in the year 876, with the death of Huang Cho during his rebellion before he could kill one hundred thousand rich Muslims in southern China. Without their deaths, Islam continued to grow in China during the centuries, especially among the rich merchant classes. Eventually, after a brutal series of civil wars, an Islamic dynasty came to power in Hangchow, and would rule China from the late 15th century until the current year, 1894. While most of China still practices Buddhism, Confucianism, and other religions, the Islamic rulers have adapted themselves to Chinese culture and customs well enough that they are accepted as rulers of China, much like the Manchu of our own world. Muslim Chinese are a growing minority group, however, especially as many of the rich at least pay tribute to being Muslim, if only for the sake of political power. In Europe and the rest of Asia, history took a very different turn. The lack of Mongols and an earlier plague that, while very deadly, also helped curb feudalism changed the political and social makeup of the entire world. In Europe, Francia fractured even further than in our world, with Middle and East Francia eventually forming Holy Germnia under the influence of the Pope in Rome, while West Francia was fractured into many different, smaller states. Eventually, the Normans of northern Francia were able to unite all of West Francia under them into a shaky, fractured state resembling less our world's France and more Austria-Hungary, with the king in Rouen having far less power and influence than he would like. Without a successful Norman invasion of England, the Anglo-Saxons remained dominant in the British Isles, forming the Kingdom of Great Britain hundreds of years later with a peaceful uniting of Scotland, England, Wales, and the various Irish states. To this day the kingdom is less united than our world's Great Britain, with significant autonomy for all states within. This is partially due to Catholicism, albeit a different brand of it, still dominating the Isles. Their primary rivals in Europe is the technocratic, autocratic Holy Germanian Empire, a federalized version of the nation with the same name that stood since the fall of the Frankish Empire. After the German Unification Wars in which a powerful German state with its capital in Worms united all the Germans, the empire rose to become the single most powerful nation in Western and Central Europe. Even Britain, with her federated colonies such as the United Kingdoms of Arcadia cannot directly threaten Germania one-on-one without possibly facing a complete loss. The Germanians have industrial might the likes of which the world has never seen before, and it has left Britain very afraid. However, the British are not without allies. Hispania, a state formed by a more peaceful reconquinista and resembling a cross between our world's Spain and Caliphate of Cordoba, is one of the other primary colonial powers, and h as even taken a large bite out of the Indian subcontinent. They were also responsible for opening up Japan to the world much earlier, and have made the Japanese into a powerful, industrialized ally. The Eastern Roman Empire, still going after nearly 2000 years, has drifted into Britain's system of alliances as well. The Romans were once the masters of the Mediterranean, but constant war with the Turks, who had been forced from Central Asia by the Kazakhs and driven across the Middle East by a stronger Persia and Caliphate, left them with only the western coast of Anatolia and the southern third of Italy, plus their various holdings in the Balkans. They are no longer even close to the military power they once were, but are no slouch when it comes to science and technology, and have created many wonders of modern science throughout the ages, with Constantinople a constant attraction for the world's greatest minds. The strongest ally to Britain, and the enemy Germania fears the most, actually lies to the east. Ruthenia, built out of the ashes of the Kievan Rus. Standing on the same principles as the old state, Ruthenia aggressively expanded throughout the centuries until it encompassed much of the world, and was able to extend its power from the Black Sea to the Sea of Japan. Though a recent civil war and war with Germania set the Ruthenians back, the government in Kiev has steered its country toward greatness, and in 1894 Ruthenia stands on the brink of becoming a superpower. Science, technology, industry, education, and the arts flow out of Ruthenia, particularly Kiev, at a rate which astonishes the rest of the world, and the state has eyes on assuming Germania's current number one spot in Europe. This is something that Germania is determined not to let happen. 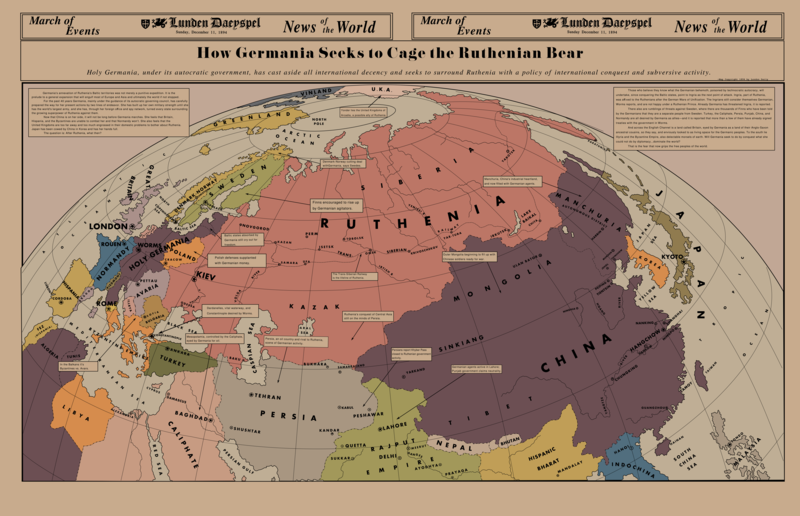 As depicted on the map printed in London, Germania has been hard at work in recent years surrounding Ruthenia with enemies. Allying themselves with the rapidly-growing power of China, Germania seeks to cut down Ruthenia before the nation can reach superpower status and be almost indestructible. Alliances have also been proposed with the Rajput Empire, a regional power, Persia, an old enemy of Ruthenia, and the Caliphate, an oil-rich nation bent on returning itself to its past glory. Combined with Germania's puppets of Avaria, Bulgaria, and Poland, it might be enough to tip the balance of power in Worms' favor and plunge the world into autocratic Germanian rule. On December 11, 1894, the world is still a pleasant place, but feels itself on the brink. With technology akin to what our world attained in the mid-20th century, and with other technologies not seen on our Earth, the world is richer and more abundant with wealth and power than we have known. Men and women can work for honest wages and live in large apartments or penthouses in the grand cities that dot the landscape of the Old World. With Christmas two weeks away at the time of the printing, Catholic Europe has settled into a happy routine of visiting friends and family, exchanging gifts, and eating to their hearts content. Yet, at the same time, the shadow of war hangs over Europe and Asia, and threatens to plunge the planet into darkness. The question on the hearts and minds of the people is not whether there will be war, but rather who will win when the "Grand War" finally comes?